Join our captain, Thanos, on board a traditional Greek motorised sailing boat and explore the forts and ruins scattered along this historic coastline. Along the way there is ample opportunity to drop anchor and swim in the sea, soak up the sunshine on deck and visit tranquil fishing villages and family run taverns to sample the delicious local Mediterranean cuisine in the evenings. Thrill of adventure at sea - Cruise around the beautiful Greek island of Evia for six nights on a traditional wooden boat. Swimming - In the warm, azure waters of the Aegean Sea, straight from the boat. Relax - Wake up to a new view every morning in the Mediterranean. Join trip at Athens International Airport. Transfer by bus to Rafina for a ferry to Evia. On arrival, there is a short taxi / minibus ride to where the Caique is moored. Thanos, our boat captain, has been working with us for many years and prides himself on showing the best parts of Greece to the many guests that have travelled with him over the years. Discovering many places that he himself used to sail around as a boy, he is a very proud Greek and loves nothing more than to captain his boat that he owns around the beautiful waters of the Aegean. Upon boarding our boat you'll be offered a welcome drink and shown to your cabins. Each morning a hearty breakfast is prepared for you consisting of fresh bread, cheese, ham, eggs, cereals, Greek yoghurt, honey, marmalades, fresh seasonal fruits and orange juice with coffee or English tea. Our captain also serves tea and coffee with biscuits or cakes at eleven o'clock on deck. After breakfast we set sail for our first destination, the bay of Panagia, a small fishing village lying in the shelter of a fjord. En route we will stop to swim in the waters off the rugged and undeveloped coastline. Once in Panagia there is the opportunity to see terrapin turtles in the streams behind the picturesque church of St Mary or swim and snorkel in the fjord waters of the bay. Lunch is generally a hot regional speciality with a vegetarian option served with seasonal salad and a traditional appetiser. Dinner will be in one of the small characterful seaside waterfront taverns offering barbecue seafood and traditional dishes with local wine, beer and soft drinks. Day 3 - Cruise to Porto Buffalo, sailing later that day to Eretria. 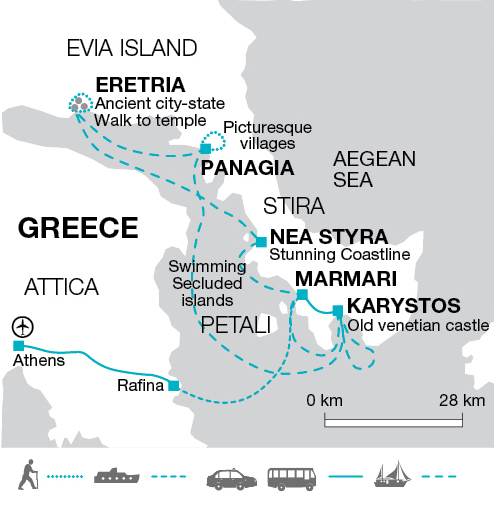 Today we will cruise to the Gulf of Evia, where the island splits from the mainland. Greek legends romantically claim that the divide was caused by Poseidon piercing the earth with his trident. We travel via Porto Buffalo, a small fishing village port in southern Evia renowned for its fresh fish, the port hosts a beautiful and private lagoon where we spend time at the sandy beach or if you wish, why not practice jumping off the boat from the top deck into the turquoise Aegean Sea. We continue at a leisurely pace cruising to Eretria, one of the most well known cities of ancient Greece and the birthplace of our alphabet. The town boasts an extensive archaeological site with a superb museum. We enjoy our evening in the long cosmopolitan promenade watching the small ferries coming and going to the mainland. We make the most of the mornings perfect location with a visit to the museum and the towns archaeological site along with time to wander along the boulevard where you will find many gift shops. Alternatively, there is the opportunity to go for a swim and snorkel before cruising towards Nea Styra. This area has a number of stunning beaches and boasts a beautiful coastline with clear waters inviting you to swim and snorkel. The rolling hills above Nea Styra lead to a silver-green valley of olive trees where we have the opportunity to explore in the afternoon. As the sun sets in the historic bay of Marathon, the promenade comes to life with all the locals and visitors experiencing a typical Mediterranean stroll before dining alfresco. Day 5 - Swim and snorkel in Nea Styra. In the afternoon cruise to Figias and on to Marmari. After a leisurely start to the day, we set sail and cruise towards Figias and onto Marmari, a typical Aegean fishing village with numerous tavernas and cafes dotted along the promenade. There is ample opportunity to swim and snorkel off the boat close to the rocky shores. This morning we cruise towards the archipelagos of Petali, where seven private and exclusive islands offer the best of a 'jet set' life in the Aegean. Once the summer residence of the Greek royal family, today it is the playground of the Picasso family, the Embiricos ship owners, and other such tycoons. Maria Calas, one of the most renowned and influential opera singers of the 20th century, spent many summers here and we drop anchor to enjoy the good life ourselves with opportunities to swim, snorkel or just relax on the deck amongst the rich and famous. In the late afternoon we set sail for Karystos. This morning we can visit the Venetian mountain castle of Castello Rosso in Gourna which is a well preserved 4th crusade fortresses that commands the sea corridor between Asia and Europe, the entry to the Black Sea. Our final stop on our cruise is Bouros in Karystos bay where we will drop anchor for the last time to swim and snorkel in the amazing clear waters of the Aegean. After docking at the harbour we bid farewell to our friendly crew. Tonight we stay in a waterfront hotel in Karystos. We can visit the famous Montofoli winery estate or enjoy an afternoon in Kohyli Coves which is walking distance from our hotel. Today we take the short taxi / minibus ride back to the ferry to Rafina or Marathon. From there we transfer to Athens International Airport where the trip ends. * The itinerary along the coast may vary depending on local weather conditions e.g. stopping points and nightstops may vary to the above descriptions. July and August are the hottest months though the islands are freshened by cooling winds. You'll need your swimming gear and an extra towel. Early and late in the season, there may be an occasional shower and you will need a warmer sweater and/or fleece for the odd chilly breeze whilst we travel between the ports. Footwear is not generally worn on board but bring trainers, walking sandals for shore excursions or walking shoes for longer walks on the island. One main piece of baggage and daypack. Remember you are expected to carry your own luggage so don't overload yourself. Space is limited on board so only bring what you need. A soft bag is strongly recommended as it is more easily stored than a hard suitcase. A daysac is useful for shore excursions. Water bottle, a torch, sunhat, sunglasses and sunblock. Please note that if you intend to sleep out on deck on some nights, as many travellers choose to do in good weather. Please bring a sleeping bag with you (the sunbathing cushions are available to sleep on the boat but cabin bedding can't be taken on deck). Limited snorkelling equipment in on board, however we recommend that you bring your own if you wish to snorkel. For this we suggest £10 per family member. 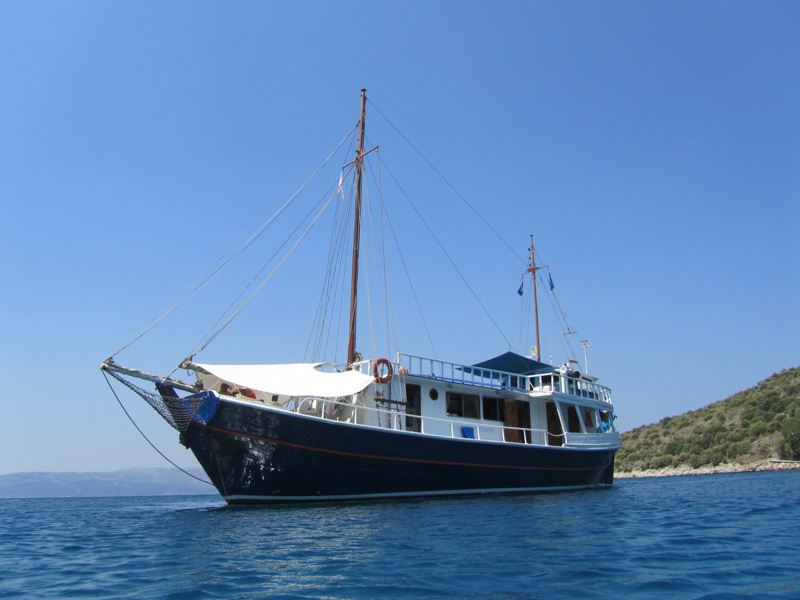 MV Isidoros II - Our traditional wooden caique has a large sundeck and a comfortable galley for meals and indoor relaxing. There is also a boat ladder to make the most of swimming opportunities. There are two double cabins on the main deck and six twin cabins on the lower deck. Cabins on the lower deck have portholes and cabins on the upper desk have windows. All are en suite. The cabins are cosy and can get warm in summer as there is no air-conditioning but each is equipped with a fan and all have power sockets (European 2 pin round). Bath and face towels are provided on the caique, so there is no need to bring your own. A safe for your personal valuables is available in the wheelhouse of the caique. While our intention is to adhere to the day-to-day route printed, a degree of flexibility is built into the itinerary. Overnight stops and even islands visited, may vary due to weather, sea conditions and the availability of mooring space in harbours. There is a chance to swim every day straight from the boat. Greek sailing holiday: Whether you are new to sailing or an old hand who knows the ropes, an Explore family sailing holiday is ideal for all abilities, no previous sailing experience is necessary. Our Greek skipper Thanos and his crew will be happy to show you the ropes and there is ample opportunity to pick up some sailing skills along the way, alternatively kick back on deck with a book and let the world float by. Wake up to a new view every morning in the Aegean Sea, swim to your hearts content during the day and head ashore to traditional seaside tavernas every night to enjoy hearty Mediterranean cuisine. 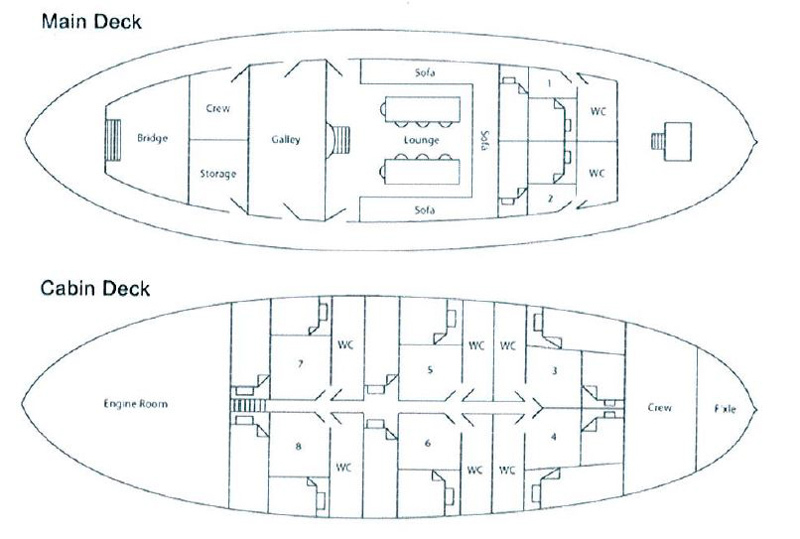 Cabin information: There are two double cabins on the main deck and six twin cabins on the lower deck. Cabins on the lower deck have portholes and cabins on the upper desk have windows. All are en suite. There are no triple cabins available. Average Age: As a guide we have identified the actual average age of the children who have travelled on this trip over the last 5 years, to help you decide whether it's the right one for your family. The average age on this trip is 12 years old, this trip is suitable for children of all ages. This holiday is designed for families who want to relax and unwind in the beautiful Aegean Sea. A week's cruising along the coastline of Evia Island with its beautiful beaches, cafe culture with locally run taverns' and a sprinkling of historical attractions is sure to be attractive. Thanos, our Greek boat captain who has been working with Explore for many years, is sure to entertain and explain the sites and routing that he has been sailing along since he was a young boy.